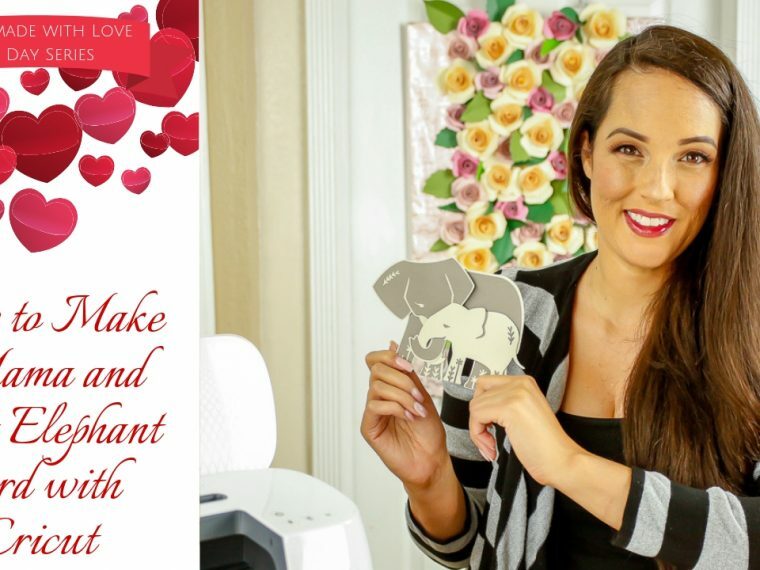 I can't wait to show you my Christmas master bedroom makeover with these Christmas bedroom decorating ideas and how I made them with diy Cricut holiday crafts. 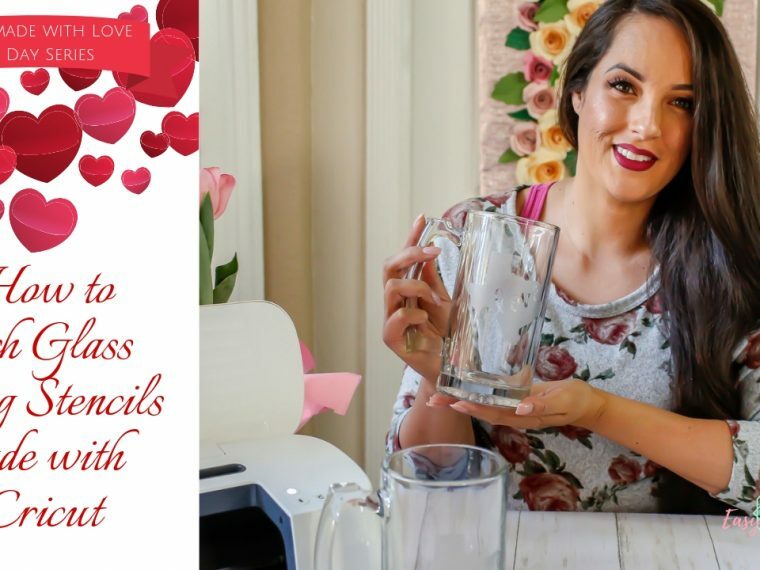 *This is a sponsored conversation written by me on behalf of Cricut. The opinions and text are all mine. . This post also contains affiliate links for your convenience. If you make a purchase through one of these links, I will make a commission at no additional cost to you. See my full disclosure policy to learn more. I LOVE decorating for Christmas. I also love spending time in my bedroom - it's my sanctuary. But especially during the holidays, and with my little boy on school break, we all love to get cozy and snuggle up in my bed to watch Christmas movies. Last year was the first time I really got into Christmas bedroom decorating ideas on Pinterest and decided to to go for it myself. I also have some apple cinnamon scented candles in the bedroom and it just makes me happy walking into my room and seeing everything looking so holly and jolly. 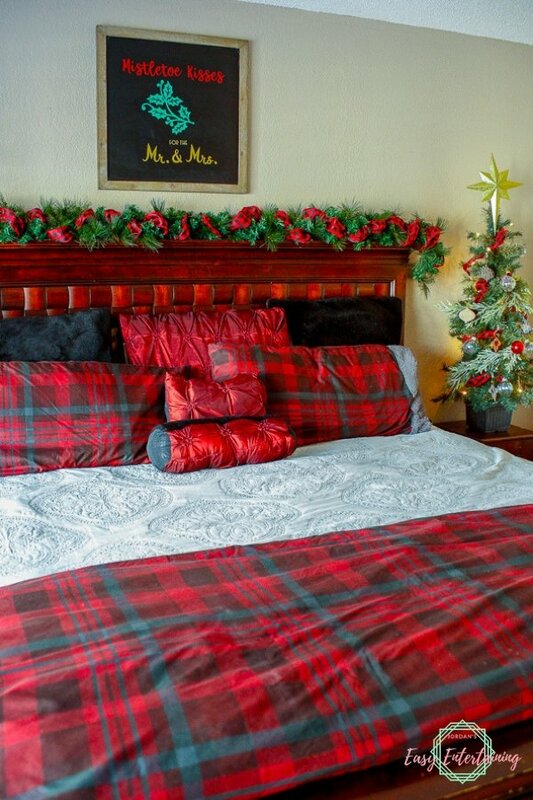 Last year I found my comforter set on a great sale and based all of the other decor on this buffalo plaid. I made the black faux fur pillow covers and also the berry colored pintucked pillows. I really don't have room for a full sized Christmas tree in my bedroom, but I think this little guy does the trick. 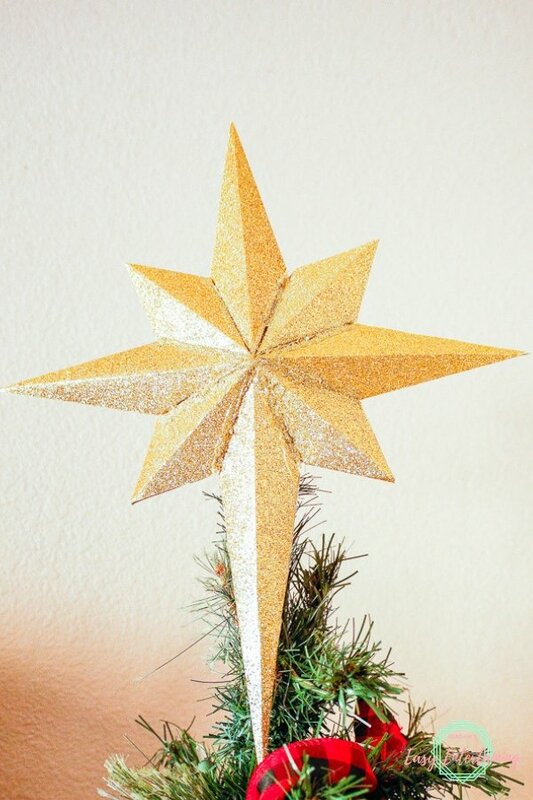 To top my tree, I made a star tree topper using my Cricut Maker. This project is all ready to go and perfectly sized for a small Christmas tree. Open up the project in Design Space and hit "make it." You can use the scoring stylus, but for glitter cardstock, the Scoring Wheel is so much better. 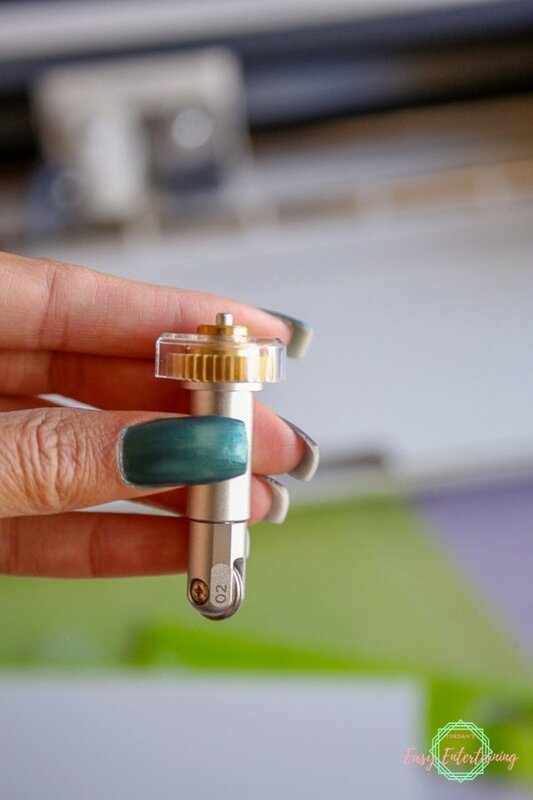 I love making 3d projects and the scoring wheel is definitely one of my favorite things about the Cricut Maker. 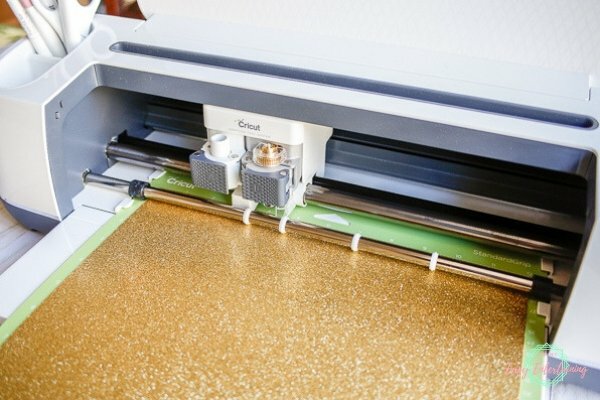 You can easily score thicker materials and get nice clean folds in your projects. 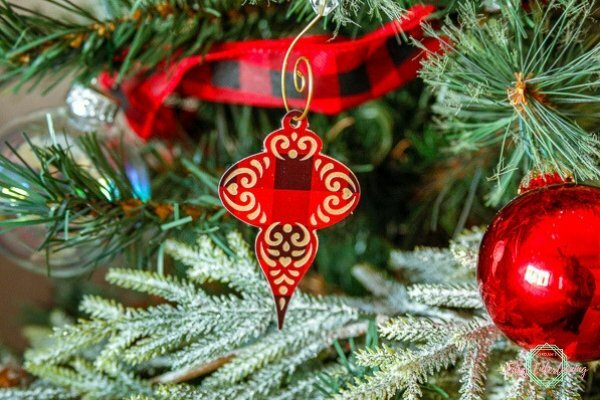 So make sure your Scoring Wheel is clamp B because your tree topper will be scored before cutting. Once it's scored, you will be prompted to switch back over to the fine point blade. After the pieces are cut out, use a straight edge (I like to use the large scraper for this) to help fold along the scored lines. You'll end up with 8 cones - 4 small, 3 medium, and 1 large cone. 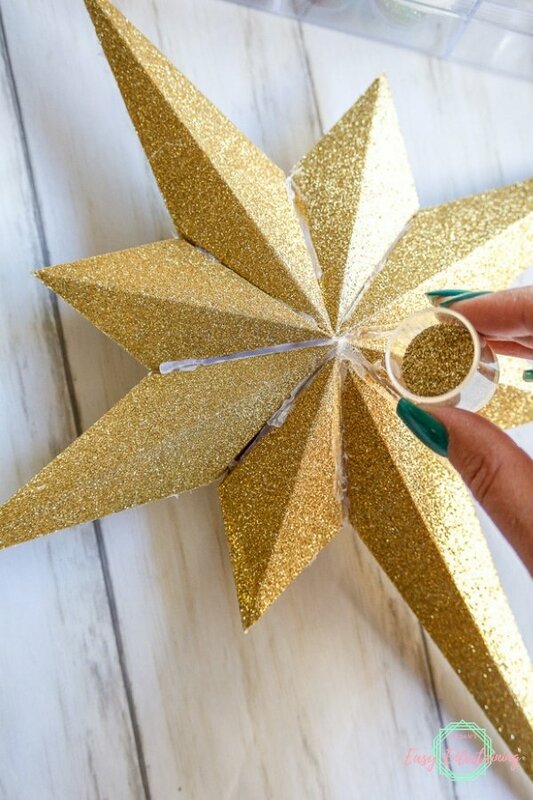 Use your hot glue gun to attach the cones together until you have your complete star tree topper put together. 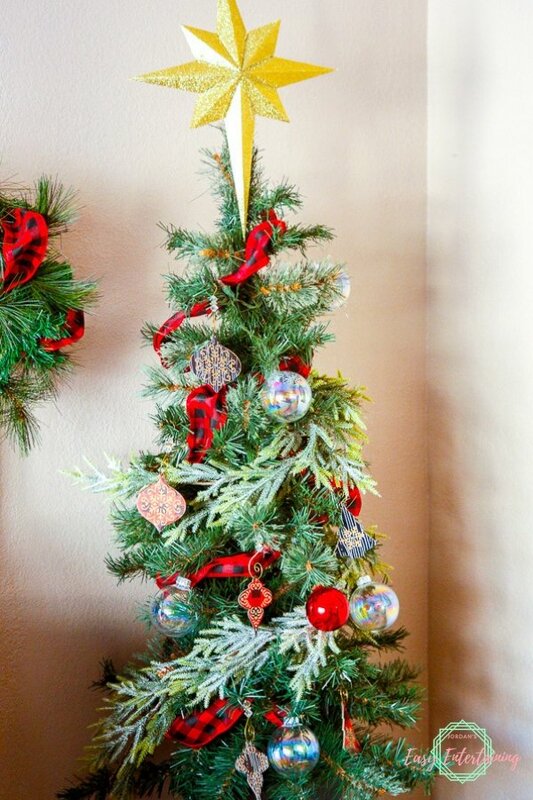 You're probably going to end up with a bunch of glue showing on the front of your start tree topper. To cover it, it's time to bust out the glitter. 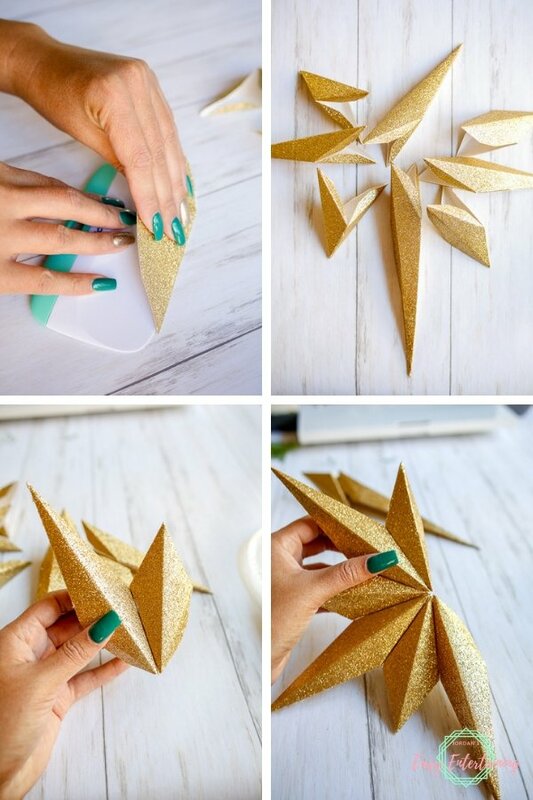 Use the school glue to cover up the seams and pour matching gold glitter directly on top. Once it's all together, I added 2 pieces of floral wire to the back of my topper with hot glue so I could attach it to my tree. Also on my mini tree are my Christmas ornaments that I made with my Cricut Maker . I made several chipboard ornaments and added matching vinyl cutouts. 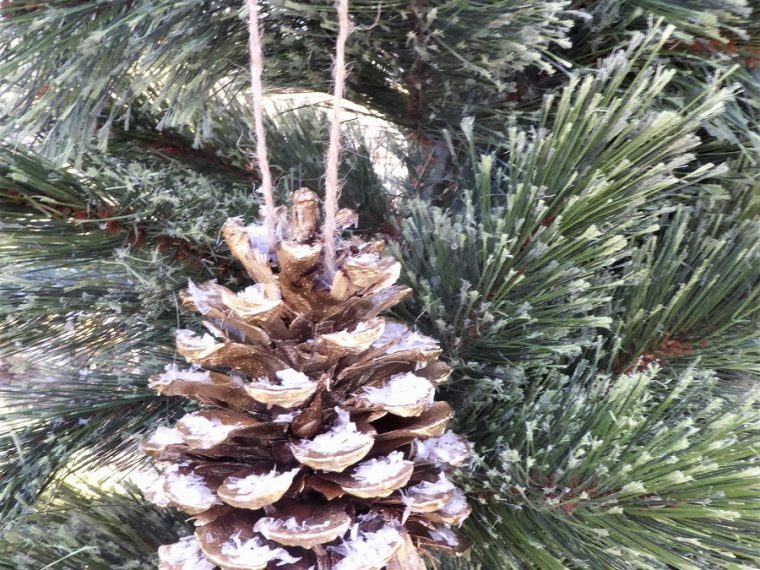 I wanted to use chipboard so my ornaments would last over the years without worry of them getting messed up. 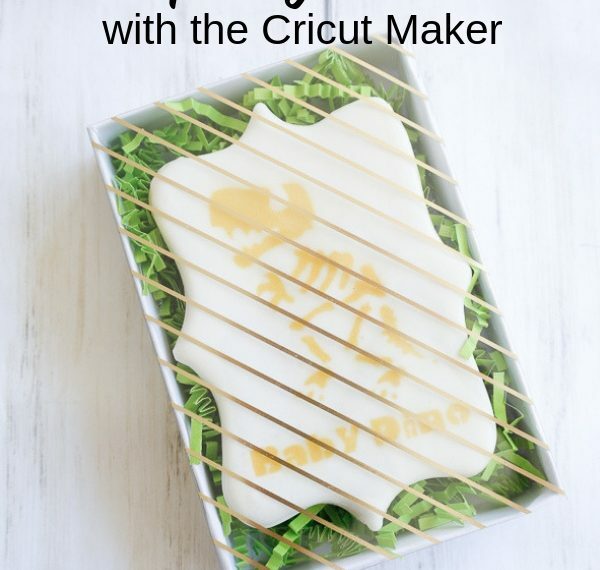 To make these, I used the Knife Blade in my Cricut Maker to cut the chipboard. It takes a long time to cut out, but I think it's totally worth it. 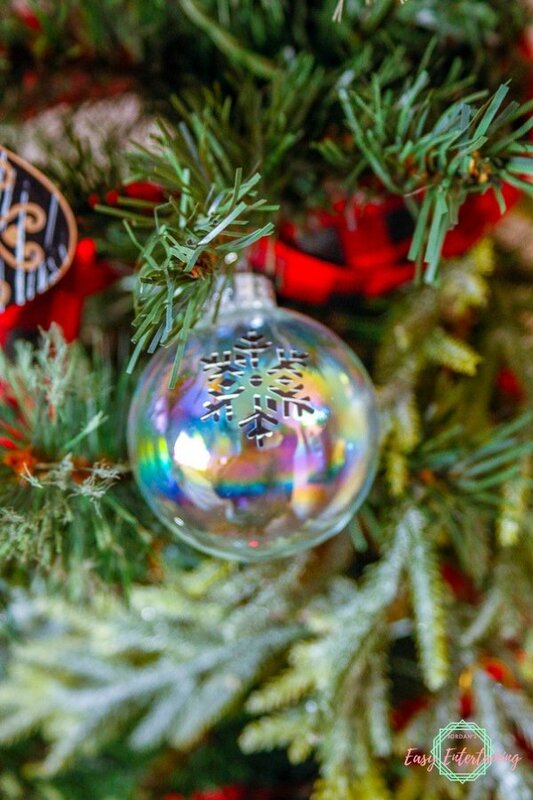 Since I liked the design that was left over from cutting the vinyl for the chipboard ornaments, I decided to use the scraps to add to my clear glass ornaments to match. 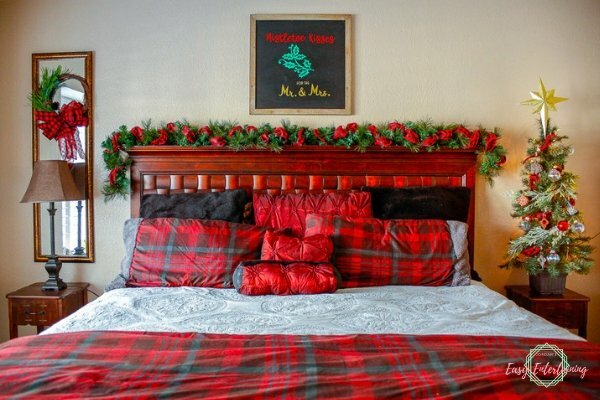 Another fun Christmas holiday craft project that I made was the sign over my headboard. This one was super easy and quick to put together. 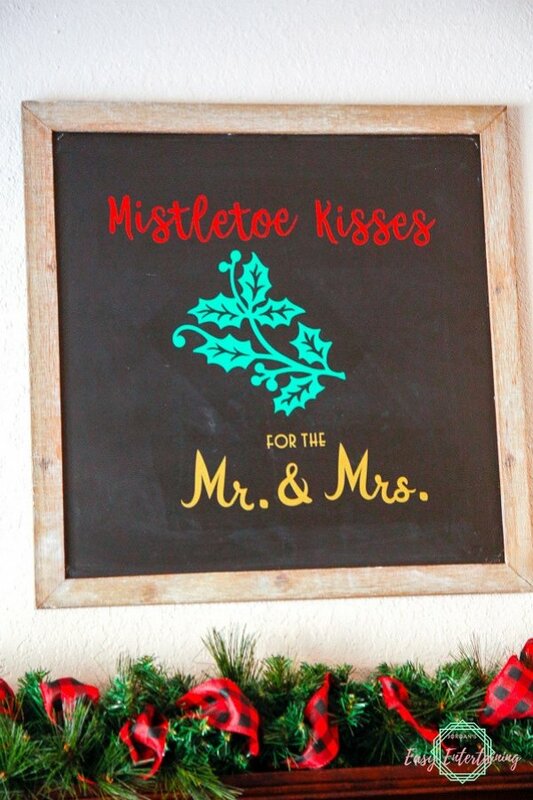 I used removable vinyl for this "Mistletoe Kisses for the Mr. & Mrs." phrase on my chalkboard sign so I can reuse it. You can find the cut file for this project here. And my final Cricut holiday craft project for my bedroom was this wreath that I placed on my mirror. 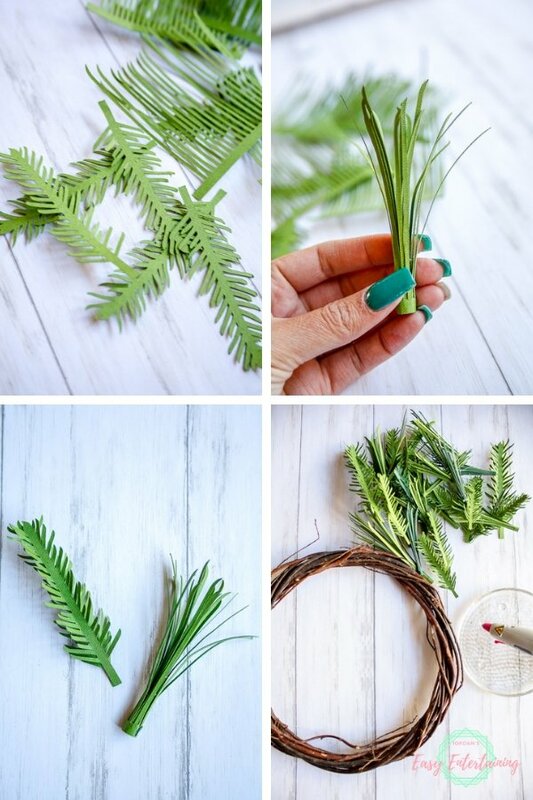 I cut out a bunch of pine branches and pine needles in different sizes, then glued them directly to a grapevine wreath form. 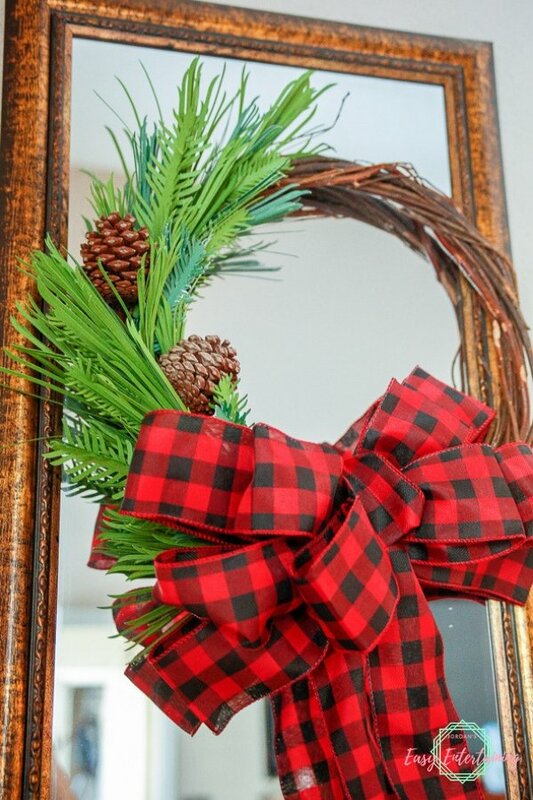 I added a couple of real pine cones and a buffalo plaid bow and my wreath was ready. 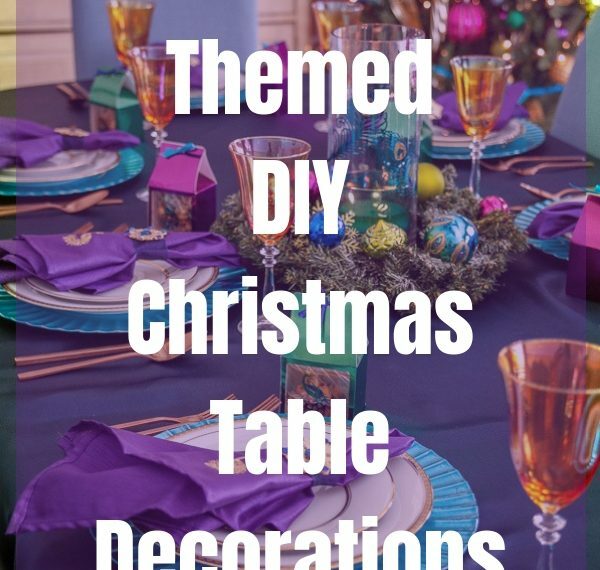 Do you like to diy your holiday? I sure do and I love how everything turned out. 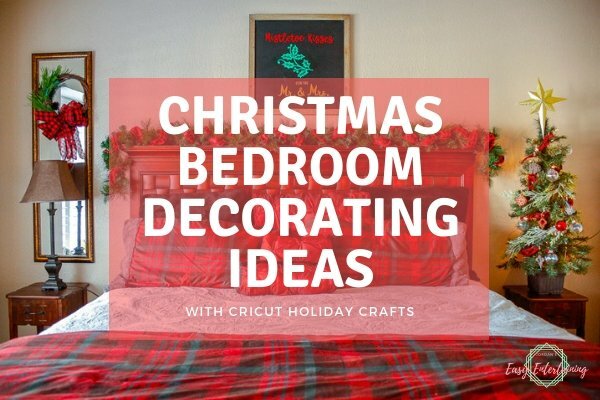 If you decide to use any of these Christmas bedroom decorating ideas or make any of the Cricut holiday crafts, I'd love to see them! Tag me on Instagram.